Before Christmas, I purchased the holiday issue of a magazine called Sweet Cakes, published by The Best of Fine Cooking. 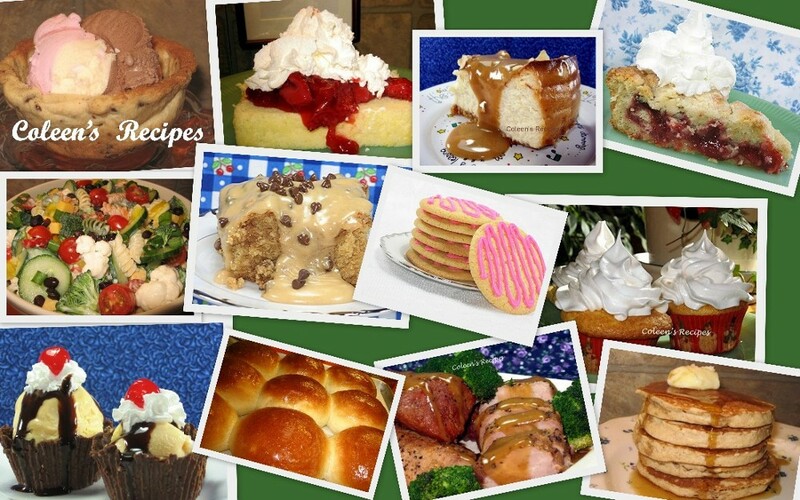 I've made several desserts from the magazine and all have been well received by Hubby and friends. Recently, Monica from Lick the Bowl Good told me she had the same magazine so we decided to try the magazines recipe for Coffee-Chocolate Cake together. I think she will be posting about it today, as well, so I hope you will visit her web site to see what she did with this great little recipe. Preheat oven to 350F and generously butter a 9" square baking pan. Line the bottom of the pan with parchment paper and butter the paper, then flour the bottom and sides of the pan (tap out excess flour). See note below. With an electric mixer, cream butter, sugar & vanilla until smooth (about 1 minute). Blend in eggs, one at a time, mixing just until incorporated (about 20 seconds). With a whisk, mix in the rest of the ingredients by hand, until batter is smooth and mostly free of lumps. Pour into prepared pan. Tap pan on counter a couple of times to remove any potential air bubbles. Bake on center rack of a 350F oven for 40 to 43 minutes. Remove from oven and set pan on a cooling rack for 20 minutes. Carefully run a knife around the edges of the pan, invert onto cake rack and remove pan. Serve immediately or store in an air tight container (at room temperature) for up to 5 days...but it won't last that long. NOTE: Although the directions say to bake in a 9" square pan and take extra precautions with parchment paper, extra greasing and flouring, I did not do ANY of that. I baked mine in a little half-bundt pan I have and I just sprayed it with a cooking spray that has flour in it (no parchment paper). It came out of the pan extremely easy. NOTE: Hubby hates the taste of coffee, so I made this cake using Earl Grey tea and it tasted great. NOTE: Wrap this cake with plastic wrap (directly on the surface of the cake) while it is still very hot. Let it cool completely like that and you will have a wonderfully moist cake that will last for several days. I do this with ALL of my cakes and it never fails. 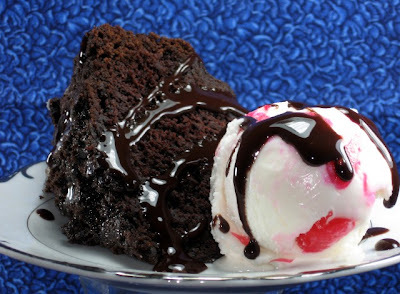 NOTE: This is such a great little one bowl chocolate cake, with excellent flavor and moistness. It would make great cupcakes and I'm sure you could double the recipe and bake it in a 9x13. ONE WARNING: If you eat this cake while it is still warm, you will not be able to restrain yourself...it is really tasty!! NOTE: Our family members are safe at the Alaska Iron Dog finish line in Nome, Alaska, although hubbies twin brother and snowmachine had to be towed the last 170 miles (by his son) and hubbies youngest brother and snowmachine had to be towed the last 53 miles (by a buddy). Both of their engines blew up (they were brand new snowmachines). At least they are all safe and off of the trail. Thanks for your well wishes. Coffee and chocolate!?! That is an amazing cake Coleen. Hi Coleen, you're a great baker. I'm impressed! So pretty baked in that rose Bundt. I opted for a round pan since the square one is a little tricky to get the corners out. I think it would work in any pan really. Thanks for baking with me Coleen. If I hadn't already baked it, your post would have twisted my arm! I hope you wont mind me following your blog! I love recipe blogs and trying new recipes! You have some great looking recipes! Glad to hear your family is well and safe! The cake looks delicious. I love adding coffee to chocolate cake. It just makes it richer! Love your new pic...dangerous to look at before breakfast though!!!! So glad your family is safe, Coleen. What an ordeal and they will have lots of stories to tell. Truely this cake looks addictive, so I've bookmarked it.I love chocolate and coffee together! Coleen..my family would love this cake! Good to hear that everyone is okay. This looks like an amazing cake. I know I'd enjoy it. 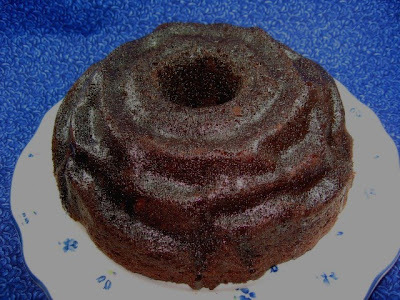 Ooo, I just got one of those 6 cup bundt pans! Can you use it in place of 8 or 9 inch cake pans then? So, glad to hear that your family is safe! That cake looks AMAZING! Love the deep rich colors and can only imagine that the flavor is astounding. Good find and share, Coleen!! !